A no-deal Brexit can only be stopped if MPs come together around “a positive majority for another solution”, the EU’s chief negotiator Michel Barnier has said. 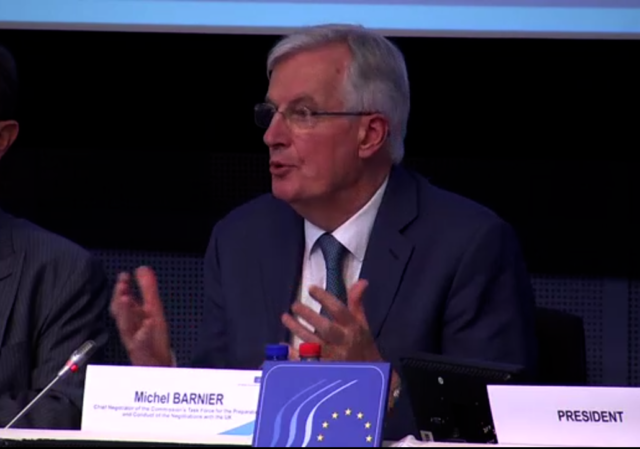 Mr Barnier’s comments appeared to suggest that Brussels would resist extending the two-year negotiation process under Article 50 simply to allow the UK to continue debating its preferred outcome. The prospect of Britain seeking to remain in the EU beyond the planned date of March 29 was increased after shadow chancellor John McDonnell signalled Labour could back plans for an Article 50 extension to stop no-deal. But leading Brexiteer Jacob Rees-Mogg suggested that the Government could prevent an extension by shutting down Parliament before MPs have a chance to vote on the plan, under a procedure known as prorogation. Mr Rees-Mogg also played down suggestions that members of the European Research Group of Eurosceptic Tory backbenchers, which he chairs, might be giving up their rebellion against Mrs May’s Withdrawal Agreement a week after consigning it to a 230-vote defeat in the House of Commons. Restating his opposition to the proposed backstop arrangement to keep the Irish border open, he said: “As long as the backstop is there I will not vote for this deal. Mr McDonnell has said it is “highly likely” that Labour will back a “sensible” cross-party amendment to provide parliamentary time to pass a bill allowing suspension of the withdrawal process if no deal is found by the end of February. The move, tabled by Labour’s Yvette Cooper and Conservative Nick Boles, is one of a number of amendments due for debate next Tuesday. International Development Secretary Liam Fox warned that some of the proposals put forward by backbenchers presented a “real danger” constitutionally. Accusing some MPs of plotting to stay in the EU, he said such an act would be politically “calamitous” and worse for the country than a no-deal Brexit. The developments came as Theresa May and Jeremy Corbyn clashed over Brexit in the House of Commons, with the Labour leader repeating his call for the Prime Minister to rule out a no-deal outcome. Mrs May denounced Mr Corbyn for refusing to meet her to discuss the way ahead, when he had previously been “willing to sit down with Hamas, Hezbollah and the IRA without preconditions”. Questioning whether Mr Corbyn understood the details of the customs union arrangement Labour is seeking, she told MPs that the opposition leader “hasn’t got a clue”. Speaking to the EU’s European Economic and Social Committee in Brussels, Mr Barnier said that there appeared to be a majority in the Commons opposed to crashing out without a deal. But he warned: “Opposing no deal will not stop no deal from happening at the end of March. To stop no deal, a positive majority for another solution will need to emerge. Some leaders of the remaining 27 EU member states had questioned why they would agree to extending Article 50, he said. Mr Barnier repeated his position that the EU was ready to pursue a more “ambitious” future relationship with the UK if Mrs May “modifies” her red lines, which include departure from the customs union and single market, an end to free movement and withdrawal from the jurisdiction of the European Court of Justice. “If the UK red lines were to evolve in the next few weeks or months, the Union would be ready immediately and open to other models of relationships which are more ambitious,” said Mr Barnier. “Each of these models is founded on a balance between rights and obligations. Speaking to the Eurosceptic Bruges Group in London, Mr Rees-Mogg suggested that the Government could use prorogation to block any backbench bills designed to thwart a no-deal Brexit. Denouncing efforts to put Parliament in charge of the Brexit process as a “constitutional outrage”, the chair of the backbench Tory European Research Group said: “Prorogation normally lasts for three days but any law that is in the process before prorogation falls.